Milestone Internet Marketing recently won several top distinctions for innovative hotel website design, digital marketing strategies, and social media marketing from Horizon Interactive Awards and Communicator Awards. These prominent industry competitions honor marketing and media companies whose work reflects creativity and impact in marketing and communications. Milestone's responsive web and mobile designs go beyond visual aesthetics and digital assets. They are built with robust architecture, strong SEO elements, fresh and engaging content, and user-friendly navigation to rank high on search engines, drive conversions and generate higher ROI. "We are proud to be honored for the web development and visionary marketing ideas that make us leaders of our craft," says Benu Aggarwal, Milestone Founder and President. "From our strategists to our designers and content teams, we are passionate about being idea makers that help our clients achieve presence and profitability." 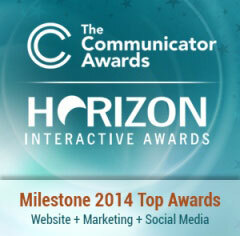 To find out more about these competitions and awards, visit https://www.horizoninteractiveawards.com and http://www.communicatorawards.com/. For more than 16 years, Milestone Internet Marketing has been a pioneer and provider of internet marketing solutions, including website design, mobile sites, content creation, social media engagement, and SEO for worldwide clients across multiple industries. With offices in Santa Clara, Chicago and India, Milestone offers cutting-edge strategies and products for hotels, resorts, brands, restaurants, spas, management companies and businesses around the world. At the forefront of innovation to achieve phenomenal return on investment for clients, our websites and promotions have garnered numerous awards across many disciplines. Milestone was named one of Silicon Valley's fastest growing private companies for 2013 by the Silicon Valley Business Journal. For more information on Milestone's services and products, please visit us at www.milestoneinternet.com.